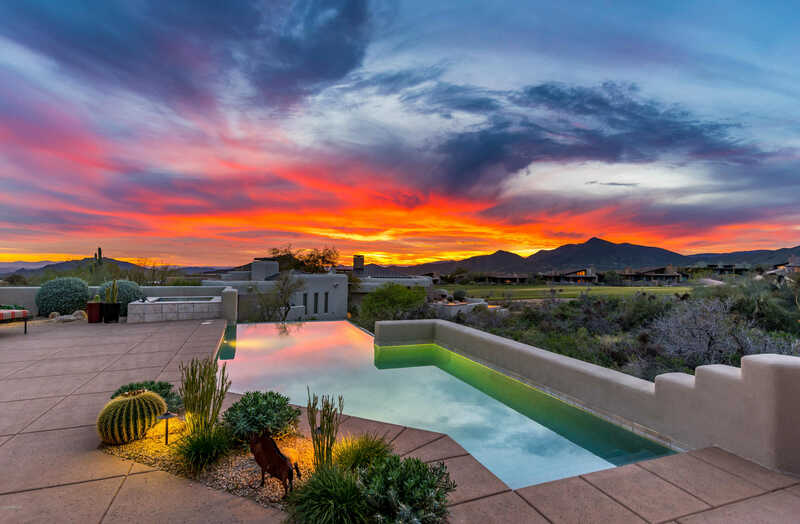 Captivating soft contemporary residence overlooking Apache golf course with patios that offer year round sunsets and panoramic mountain views from Pinnacle Peak to our very own ”Apache Peak”. Intelligent and manageable split floor plan with dual master suites give those in residence the privacy they seek within elegant and spacious living spaces. Pretty kitchen opens to the family room and great room for seamless and easy entertaining while enjoying the sun filled glass supreme architecture. Fireplace on the patio creates two distinct generous conversation spaces while you enjoy the fairway views. Large casita boasts a natural stone fireplace and steam shower with its own private patios to enjoy the visual feast of vistas that surround. Close to the Sonoran Club. Directions: Please take Cave Creek Road to Desert Mountain entrance just west of Pima. Guard will direct. Please call agent to show. Approximate size: 25000.00 sq. ft. Please, send me more information on this property: MLS# 5907868 – $1,595,000 – 10976 E Graythorn Drive, Scottsdale, AZ 85262. I would like to schedule a showing appointment for this property: MLS# 5907868 – $1,595,000 – 10976 E Graythorn Drive, Scottsdale, AZ 85262.